“Smart home” is the term commonly used to define a residence that has appliances, air conditioning, lightning, computers, TVs, entertainment devices or security that are capable of communication with one another, can be controlled remotely or run on a schedule from any room in the home or from any location in the world by phone or Internet. Basically, it encompasses a wide range of products and devices that allow automation by the consumer. According to Statista.com, the largest market in 2015 (by total volume) was concentrated in the United States, which produced over $9,700 million in revenue. In comparison, Japan (the second-largest market) produced only $1,128 million in market revenue. The United States also had the highest penetration rate in the smart home market (5.8 percent). 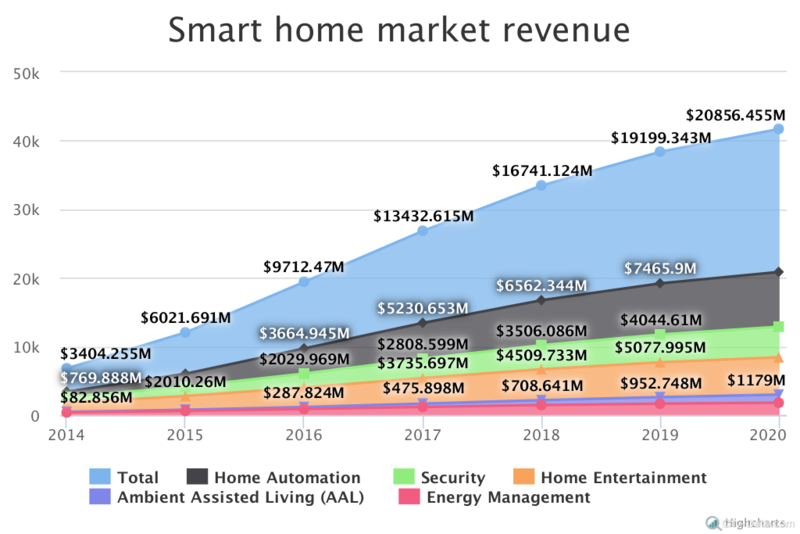 The most revenue of the smart home market in the United States came from the home automation sector — about $3,664 million in 2015. Home entertainment took a huge piece as well: $2,851 million in 2015. The revenue of security automation amounted to $2,030 million, while the energy management sector produced approximately $878,000. In the next couple of years, the revenues of the smart home market are expected to grow, according to the forecast. Thus, in 2017 the smart home market will generate $13,433 million. In 2018 and 2019 the number will grow to $16,741 million and $19,199 million respectively. By the end of 2020, the market’s revenue is expected reach more than $20,800 million in the United States. 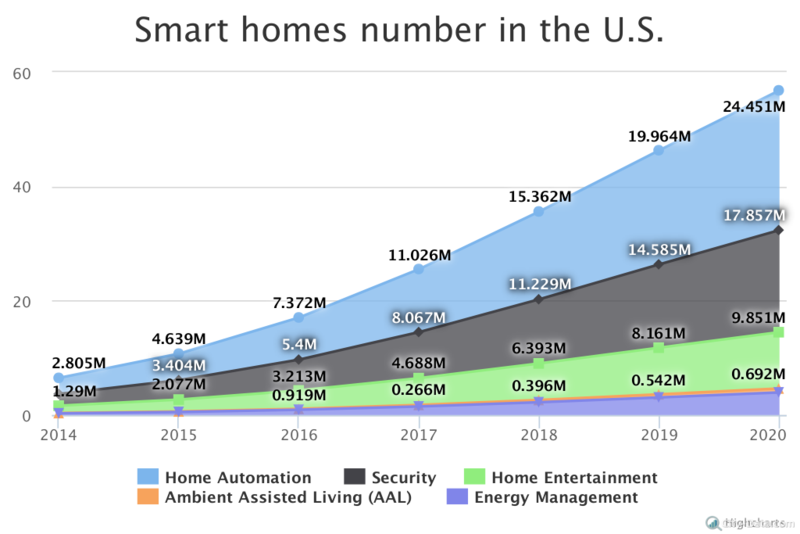 Home automation still will hold the largest share, producing $7,465 million dollars. The number of active households is also expected to grow to 24.5 million in 2020. In 2016, the total number of active households will be around 7.4 million people. Households utilizing home automation will make up the largest portion, with 2.8 million active houses. We should also note the rising numbers of active households in the next three years: 11 million in 2017, over 15 million in 2018 and 20 million in 2019. Despite the high device prices and limited consumer demand, the smart home market in the United States is growing and prospering. Previous PostMental health problems in the United StatesNext PostCan innovation in Texas compare to California?